Scientists may have spotted waves in the seas of Saturn's moon Titan, as depicted in this image. A mysteriously bright anomaly winked in and out of existence on the seas of Saturn's largest moon, Titan — potentially the first time waves, bubbles or some other unknown features have been seen there, scientists say. Scientists usually call this spot a "transient feature," but the researchers have playfully dubbed it "Magic Island." Titan, the largest of Saturn's 62 known moons, is 50 percent wider than Earth's moon and 80 percent more massive. You can watch a video about the "Magic Island" on Space.com. The strange anomaly in Titan's seas is circled in red. Using radar aboard NASA's Cassini spacecraft, Hofgartner and his colleagues peered through Titan's thick, hazy atmosphere to analyze Ligeia Mare, the second-largest sea on Titan. Ligeia Mare is named after one of the Sirens from Greek mythology, and is about 48,650 square miles (126,000 square kilometers) in size, making it larger than North America's Lake Superior. After the Cassini probe sent data to researchers in July 2013, the researchers flipped between older Titan photos and the newly processed images, to look for any hints of change. This is a long-standing method used to discover asteroids, comets and other worlds. "With flipping, the human eye is pretty good at detecting change," Hofgartner said in a statement. Titan's seas and lakes are usually pretty dark, Hofgartner said. "The way the radar system works is by transmitting radio beams at Titan, which scatter off its surface and back at the radar system. The seas are normally so flat; all the radar energy is scattered away and doesn't come back to the spacecraft, so the seas appear perfectly dark," he explained. However, in July 2013, Cassini detected features that are essentially as bright as the surrounding terrain. The anomaly disappeared after subsequent observations. "These are not stagnant seas — they are not unchanging and constant in state," Hofgartner said. "They are active and do change." It remains uncertain "precisely what caused this 'magic island' to appear, but we'd like to study it further," Hofgartner said in a statement. He and his colleagues detailed their findings June 22 in the journal Nature Geoscience. The bright anomaly occupies an area of about 6.2 by 12.4 miles (10 by 20 km), Hofgartner said. "We don't think this is one large feature, but it is probably broken up into a few features — some no bigger than about 1 km by 1 km [0.6 by 0.6 miles]," Hofgartner said. "However, we do think at least one of them is bigger than 1 km by 1 km." The researchers do not think this anomaly is an alien creature or spacecraft. Rather, now that Titan's northern hemisphere is entering its summer season, "it's probably receiving enough solar energy to drive winds and power other phenomena," Hofgartner said. The seas are normally very smooth on Titan, "with features no taller than 1 to 3 millimeters (.04 to 0.12 inches), making them smoother than any natural surface on Earth," Hofgartner said. "This is because the winds on Titan have likely not been strong enough to create waves. Now, however, the winds might be getting stronger, and we might be seeing waves," he added. Another possibility is that the bright anomaly could represent gases pushing up from the seafloor and rising as bubbles. It could also represent solids becoming buoyant with the onset of warmer temperatures and floating on the surface, or solids that are neither sunken nor floating, but rather suspended in the sea like silt in a delta on Earth. "As summer comes on Titan, we hope to learn more about the seas there," Hofgartner said. Discovering more about how the seas of Titan work "can help us with future plans to explore Titan," Hofgartner said. 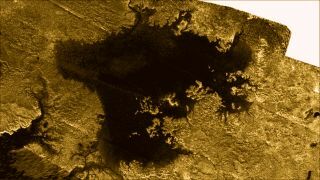 "One plan is to put a boat or raft on Titan's seas to study it in more detail, and understanding what processes are happening there now can tell us what instrumentation to bring and also how to improve the safety of the craft as well," he said.